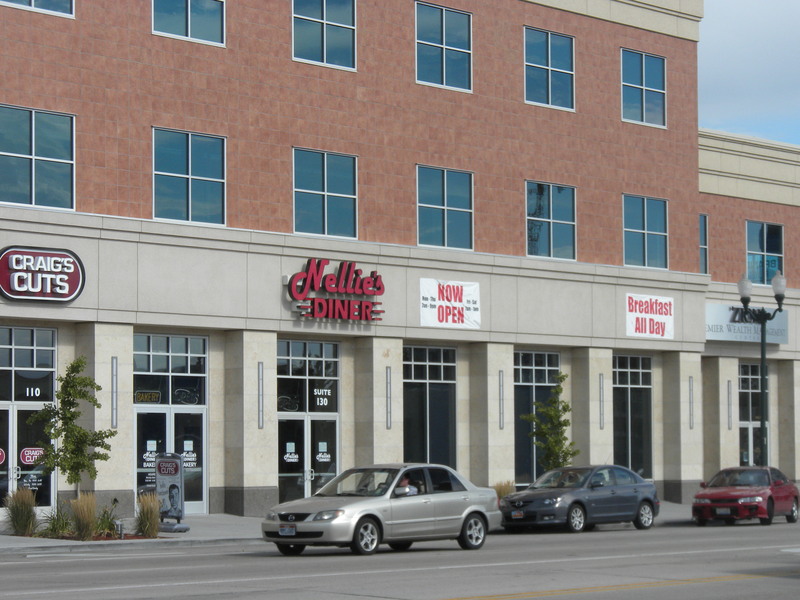 Less than three months after it opened, Nellie’s Bakery and Diner has thrown in the towel. And whatever the restaurant did right or wrong, I’m sad that I’ll no longer be able to get great French toast and artisan bread — particularly peasant bread — in downtown Provo. You can read the message posted on the restaurant’s doors in the image below. Owner’s statement explaining the restaurant closure. Based on that statement, it sounds like the restaurant may have anticipated some source of funding that didn’t materialize as expected. Nellie’s also was plagued by trouble from the get-go; opening dates were repeatedly pushed back by equipment delays, so that process may have unfortunately eaten up more funding that expected. But what stands out to me most about this situation is how massive the overhead must have been at Nellie’s. Most obviously, the restaurant opened in the newest large structure in Provo, the Zion’s Bank Building. Maybe Nellie’s cut some sort of deal with the building owners, but otherwise that was probably the absolute most expensive place to operate a business. No wonder it lacked sufficient capital while other restaurants in older buildings have survived. On top of that, the space was massive. I was consistently surprised at how busy Nellie’s often was and yet how, despite having more people than many other downtown restaurants, it felt emptier. It was the exact opposite strategy taken by smaller restaurants like Communal, Black Sheep Cafe, or Rice King, as well as larger restaurants with highly partitioned space like Los Hermanos or Gloria’s Little Italy. 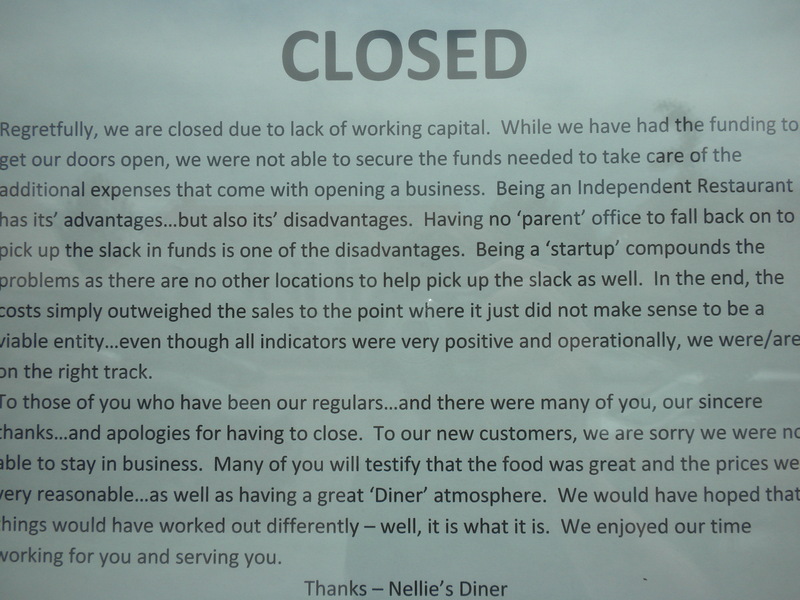 The result was that Nellie’s was (probably) paying more for its space but getting less out of it. That’s a toxic recipe for a restaurant. As the note mentions, Nellie’s also had no parent company to fall back on. That makes opening in a brand new building particularly difficult. Most restaurants that open in new strip malls and shopping centers, for example, are generic chains. Applebee’s, Chili’s, Olive Garden, etc., etc., etc. Even City Creek has more chain restaurants than originally anticipated for this same reason. The reason for this phenomenon isn’t because bland restaurants like bland buildings, it’s because they’re the only ones that can afford the rents that come with new development. Ultimately, new real estate is just really expensive and only the richest tenants can afford to rent it. Jane Jacobs used this fact to argue for historic preservation. In The Death and Life of Great American Cities she argues over and over again that old buildings with cheaper rent allow people with a lot of creativity but fewer funds to set up shop and thrive. Communal, Black Sheep Cafe, Station 22 and just about every other restaurant in downtown Provo bear that point out. Gloria’s even started in a cheaper, smaller location and moved to a more expensive spot — but still one in an old structure — after its owners built up the business. Braza Express — one of the most underrated restaurants in Provo — also operates in the Zion’s Bank Building, but uses about half the space that Nellie’s had (and seems to be struggling, unfortunately). I have no idea what contributed to Nellie’s rapid demise and maybe a cheaper space wouldn’t have made a difference in this particular case. I also think the owners should be commended for their efforts. Some of the food at Nellie’s was great, and by Saturday evening a fan had even wedged a thank you note in the door. But the restaurant’s rise and fall illustrates why a city needs diverse architecture and infrastructure: without it, entrepreneurs — culinary or otherwise — simply have nowhere affordable to set up shop and innovate. Nellie’s Diner opened in May and closed by July. They didn’t even have time to take down the “Now Open” sign. Bummer, I didn’t get a chance to try it. Why does rent have to be so expensive? @Janey, that’s a great question. Provo City and property owners in Provo keep talking about how many people will flock into town with the new Convention Center and eventually the downtown LDS Temple. B/c they think this will happen, they set their rent values high and have a hard time budging to offer a reasonable price. Why pay a ton for rent while a dozen stores downtown are vacant (e.g. the Pennyroyale lettering is still on it’s windows 3 years after closing down)? It’s all based on hopes for the future. Is that why Pennyroyal & Roosters left? At a minimum, property owners need to cover their and they have a minimum rent they have to charge just to break even. A new building like Zion’s cost tens of millions to construct and so rents going to be pretty high (unless, of course, they cut a deal like Jim suggested). Thanks for this explanation. I kept meaning to write something in response to the question above, but this is perfect. I always felt that Nellie’s was WAY too big for a restaurant of it’s type. Look at Sammy’s, which is one of the smartest, and most successful small businesses in Provo. Look at J-Dawgs. They initially sold the idea that they were popular restaurants by their absolute lack of size. That being said…I will miss what had quickly become The Echo Theatre’s new cast/crew/and patron hang out.